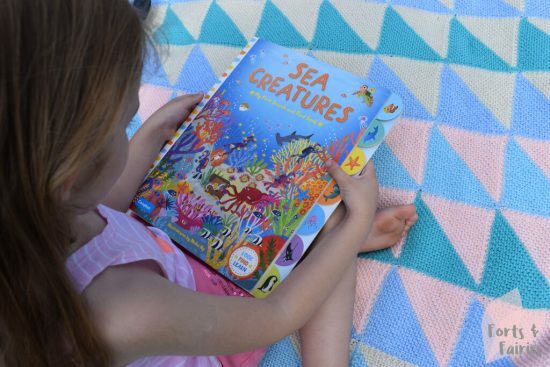 Sea Creatures is a search and find book for young children about the ocean. 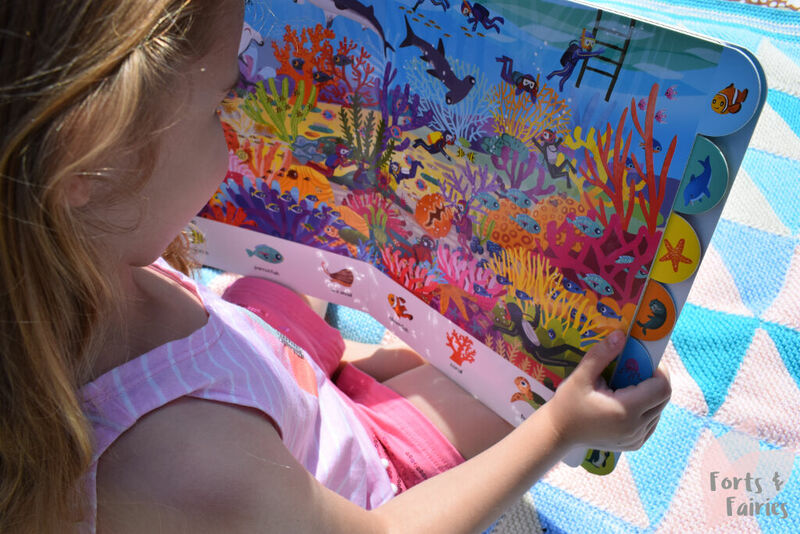 This large board book includes seven different themed scenes, each easily identifiable by the sturdy tabs that are also easy for little hands to flip between. Being a search and find book, readers will be challenged to search for different creatures and objects in each scene. The short text on each scene will ask you to spot certain animals, while the search and find pictures at the bottom of each scene will also identify animals to be spotted in the scene. For example, the coral reef will see you looking for angelfish and coral, while the rocky shore will have you keeping an eye out for the crabs, starfish and more. There is a lot of variety with the different scenes, deep down on the seabed, next to a shipwreck, and the frozen seas all offer diverse environments and creatures. Each of the different scenes are beautifully vibrant and colourfully detailed to keep little ones’ attention as they learn about all of the amazing sea creatures that live in our oceans. With all of this detail you’ll also be able to teach your children about life under the sea, and the bonus is that toddlers and young children will enjoy reading this book together. Being a board book, it is great for the toddlers to read, and they will enjoy pointing out the different animals. My one year old son loved reading it together with my three year old daughter and I. But I found that she would also enjoy reading it by herself, she would identify what needed to be found in the picture and then find it herself! Sea Creatures: My First Search and Find Book is available at a recommended retail price of R200 from bookstores and online retailers. You can also look out for Dinosaur Lands in this series, which will teach children all about dinosaurs by searching for them and finding them in different scenes. Thanks to Pan Macmillan for taking us on a journey below the waves. This is a great starting point to teach your little ones about sea creatures, you should check it out!